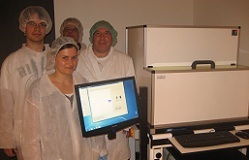 A MicroWriter ML has been successfully installed in the Humboldt University of Berlin. The machine will be used in the Novel Materials clean room in the Institut für Physik. Headed by Prof. Saskia Fischer, the Novel Materials Group studies spin and quantum transport phenomena and the physics of nanostructures. The machine will join a range of existing bottom-up and top-down lithography techniques within the group, creating outstanding capability in interfacing electrical contacts to nanostructures.